The November issue of CQ is our first annual Technology Special, full of articles and columns reflecting the wide range of amateur radio technology. We start out with "Radio Arcala, OH8X - More than a Super Contest Station," by Scott Wood, VE1QD. 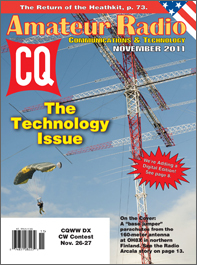 The contest station is amazing enough, with massive antennas producing massive signals and the ability to control it from anywhere in the world; but even more amazing is the Radio Arcala group's efforts to recruit young hams through the use of avatars, "augmented reality" and even - as seen on the cover - parachuting off of the 160-meter antenna! 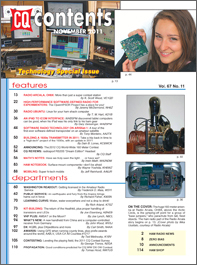 If you think building software-defined radios is the exclusive province of a few ham manufacturers, Jeremy McDermond, NH6Z, has evidence to the contrary, introducing the Open HPSDR Project in his article, "High-Performance Software-Defined Radio for Experimenters." And speaking of open-source software, T.M. Hart, AD1B, writes about getting out from under the yoke of high-priced operating systems in "Radio Ubuntu: Linux for Your Ham Shack Computer." If you're trying to figure out how to use your new iPad (or anticipating one for the holidays) to control your ham rig, Gary Geissinger, WA0SPM, found that necessity is the mother of invention when he needed to stay face-down in bed for 10 days due to medical procedure. He built "An iPad to ICOM Interface" in order to control his rig and run RTTY and PSK-31 from his tablet while being indisposed. Software-defined radio is finding a home over our heads as well as here on the ground. AMSAT Vice President of Engineering Tony Monteiro, AA2TX, explains the software-defined transponder (SDX) and other hi-tech stuff that went into the ARISSat-1 satellite which was hand-launched last summer from the International Space Station. (Is this hobby cool or what? Who but hams can get a crew member on the ISS, during a spacewalk, to toss a little satellite into orbit? With full knowledge and approval of all space agencies involved, broadcast live on NASA TV? Keep this in mind next time someone tells you how old-fashioned ham radio is! -- ed.) Next, we go back in time to "Building a 1930s Transmitter in 2011," by Dain Lones, KC6WCK. The cool thing here is that Dain -- who's 92 -- has built this radio twice: once back in 1934 and again in 2011! Read the article for the story behind the story. We've also got a CQ review of the radiosport RS20S "Dream Edition" headset, which feels great to wear and blocks outside noise by 24dB. 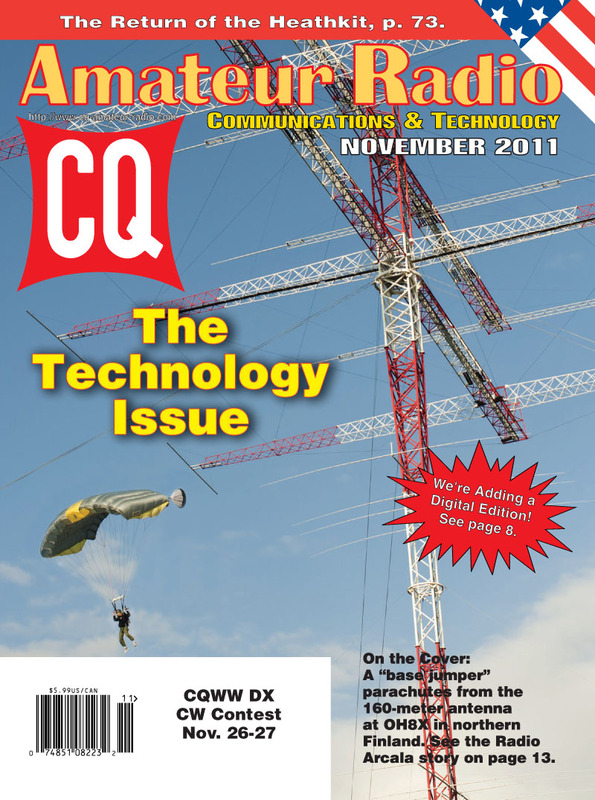 As always in our November issue, we have the rules for the 2012 CQ World Wide 160-Meter Contest. Once again, the contest will begin at 2200 UTC on Friday and will end at 2200 UTC on Sunday (CW on January 27-29; SSB on February 24-26). Among our columns for November, Irwin Math, WA2NDM, writing in "Math's Notes," looks at the new types of light bulbs we'll all be using in the future as the venerable incandescent lamp fades into the sunset; "Washington Readout" editor Fred Maia, W5YI, discusses getting your ham license and keeping it up-to-date; and Public Service Editor Richard Fisher, KI6SN, reports on the earthquake and two hurricanes that hit the east coast in quick succession in late August. Those tropical storms are on the mind of "Learning Curve" editor Rich Arland, K7SZ, who looks at why hams did not appear to be heavily involved in emergency communications in flooded areas of Pennsylvania. "Kit-Building" editor Joe Eisenberg, K0NEB, returns to our technology theme, chronicling the return of Heathkit to kit manufacturing as well as proper handling of transistors and LEDs when building kits of any sort. "Ham Notebook" editor Wayne Yoshida, KH6WZ, covers a related topic with a primer on building projects with surface-mount components. Mobiling Editor Jeff Reinhardt, AA6JR, looks at a "Super Hi-Tech Mobile" - the Los Angeles County Fire Department's mobile incident command units -- and "What's New" editor John Wood, WV5J, looks at a new handheld from China and a computer-controlled receiver from Germany. "VHF-Plus" editor Joe Lynch, N6CL, speculates about "AMSAT on the Moon? ", DX Editor Carl Smith, N4AA, profiles new 5-band WAZ recipient Michael Elliott, KQ0B, and looks ahead to upcoming DXpeditions. We also introduce new CQ DX Awards Manager Keith Gilbertson, K0KG, who's picking up the ball following the retirement of Billy Williams, N4UF, after a run of more than 30 years! (Thank you, Billy, and welcome, Keith! -- ed.) Awards Editor Ted Melinosky, K1BV, discusses the pitfalls of using GPS while "running" county lines for USA-CA award contacts, and introduces prefix awards from around the world. Contesting Editor George Tranos, N2GA, talks about leveling the playing field and presents the 2011 CQ Contest Survey (click here to take the survey online); and Propagation Editor Tomas Hood, NW7US, predicts good conditions for both the SSB weekend (Oct. 29-30) and the CW weekend (Nov. 26-27) of the 2011 CQ World Wide DX Contest. See Tomas's last-minute forecasts on his website at <http://prop.hfradio.org>. That's a brief look at what's coming up in the November issue of CQ magazine. For information on becoming a CQ subscriber -- to either our print or digital edition -- click here! Now available: 2012-2013 CQ Calendars! Click here to order today!